UPDATED: Mon., Sept. 3, 2018, 8:39 p.m.
1. The Spartans are 45-152 all-time in games against the Pac-12 Conference, but their winning percentage against the Cougars (36.6) is tied for the best, with Arizona State, among current Pac-12 members. But it’s been 12 years since SJSU has notched a Pac-12 win – the last one coming in 2006 against Stanford. Since then, the Spartans have lost 11 in a row. 2. Patrick and Vika Nunn will be conflicted come Saturday night, with a son playing for each team. Their oldest, Leki Nunn, is a freshman wide receiver for the Spartans who got his first collegiate action in the season opener against UC Davis. Younger brother Patrick Nunn is a nickel defensive back for the Cougars who didn’t appear in the season opener against Wyoming but is listed as Hunter Dale’s backup on the depth chart. 3. In a recent Reno Gazette-Journal column, it was pointed out the Spartans haven’t put together a winning season in any of the major sports – football, men’s basketball, women’s basketball and baseball – since joining the conference in 2013. SJSU’s most recent winning football season came the previous year, under current Colorado coach Mike McIntyre, when the Spartans went 11-2 and beat Bowling Green in the Military Bowl. What is it? Washington State (1-0) will face its second Mountain West opponent in as many weeks when the Cougars host San Jose State (0-1). When is it? The game starts at 8 p.m. Saturday. Who is favored? The Cougars opened Sunday as 34-point favorites, but the line moved to 35½ Monday. How did they fare last week? SJSU opened the season with an embarrassing 44-38 home loss to FCS opponent UC Davis. WSU overcame a six-point deficit in the third quarter, eventually running away with a 41-19 win over Wyoming in Laramie. 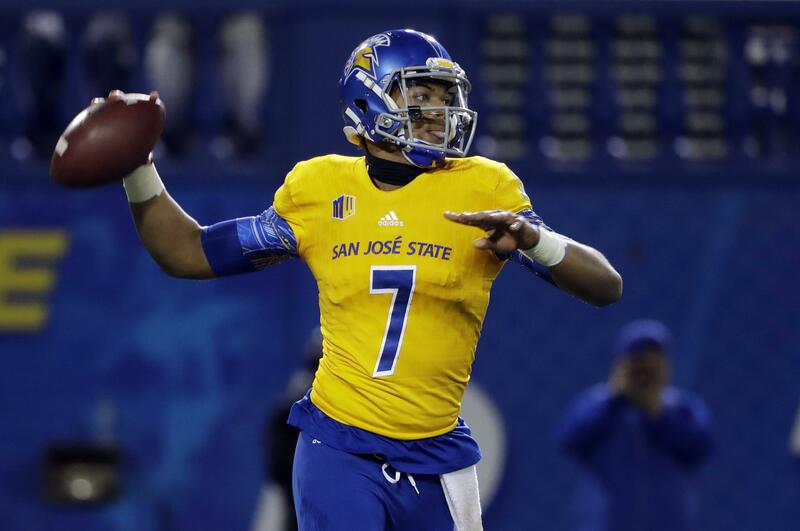 Why SJSU will win: The Cougars have overlooked lesser opponents before – Eastern Washington in 2016 and Portland State in 2015 being the most recent examples. Yes, it would take something much more colossal for this particular SJSU team to escape with an upset, but it’s never ideal to let a team like this hang around. Why WSU will win: In a Mountain West preseason poll that had the Cougars’ last opponent, Wyoming, picked to finish second in the Mountain division behind only Boise State, the Spartans were pegged dead last in the West division. SJSU’s defense has given up 40 points or more in 10 of its last 14 games and 39.9 per game since the 2017 season opener. This isn’t a good sign for the Spartans one week before squaring off with the Washington State Air Raid: UC Davis quarterback Jake Maier completed 37 of 55 passes, totaling 446 yards through the air and three touchdowns in the game last week. What happened last time? WSU’s quarterback, Gardner Minshew, will be wearing No. 16 this weekend – same as the last time these teams met. On the first day of October in 1996, Ryan Leaf threw for a school-record 305 yards by halftime and eventually reached 355 while dialing up four touchdown passes for the third consecutive game. Michael Black rushed for 109 yards and two TDs as the Cougars rolled up 564 yards of total offense in routing the Spartans 52-16 at Martin Stadium. Published: Sept. 3, 2018, 12:51 p.m. Updated: Sept. 3, 2018, 8:39 p.m.